For just £33.95 we will send you your personal magazine by post. Every issue is packed wih exciting ideas, up-to-date articles with stunning photography and expert advice and entertaining writing. Not only will you have a magazine that both women and men can enjoy, but you will probably save more than the price with the tips and ideas contained in every issue. As a bonus every subscriber gets free access to our Legal Helpline. You can ring the number 24-hours a day 365-days a year to get a solicitor’s initial advice on any problem you have. It could be a problem with a tradesman, a faulty electrical item or the neighbour’s hedge. It will save you paying for that first consultation and more importantly give you peace of mind to know you can use it whenever you need it as many times as you require. A subscription to Choice makes a great gift for a friend or relative. Every month they will be reminded of your Xmas, birthday, anniversary or thank you present and they will also get all the benefits of this excellent magazine. The Choice Retirement Planner New Choices is a comprehensive bible of retirement. Choice offers any business or organisation looking to target a clearly defined 50+ audience with highly cost effective advertising packages. 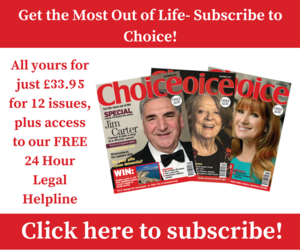 Choice is the UK’s leading independent monthly for men and women over 50 - a role it has fulfilled for more than 40 years.